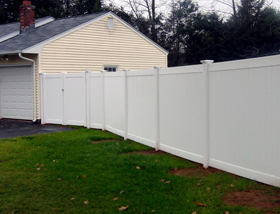 Everest "Extra Heavy Duty" white privacy fence is very strong with tongue and groove pickets that lock together creating full privacy and security for your property;they are made to withstand at least 110 mile / hour winds! The Everest looks the same on both sides and comes standard with 72" Tall x 96" Wide Price Includes one post and one standard cap and 2" x 2" x 94" H Channel Aluminium Inserts per section Heavy Duty Commercial Grade. 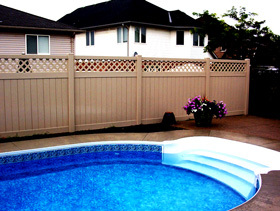 The classic beautiful look of wood, combined with the durability and long life of vinyl in one, terrific vinyl fence product it is the answer for those people who are looking for the better of the two worlds. 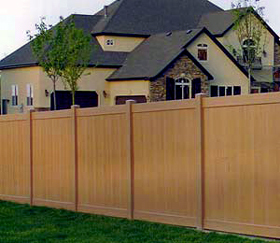 Look no more we got your dream at KC Fence and Deck. Wood Grain Extra Heavy Duty is very strong with tongue and groove creating full privacy and security for your property.they are made to withstand at least 110 mile / hour winds! This fence style looks the same on both sides and comes standard with aluminium reinforcement in bottom rail, 72" x 96" Price Includes one post and one standard cap and 2" x 2" x 94" H Channel Aluminium Inserts per section. 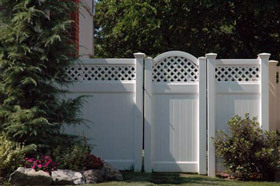 For a unique touch of elegancy combined with privacy fence choose our tongue and groove privacy fence with lattice. they are made to withstand at least 110 mile / hour winds!This section has a reinforced bottom rail with a six inch tongue and groove slat. Each section with lattice comes with 72" Tall x 96" Wide Price Includes one post and one standard cap and 2" x 2" x 94" H Channel Aluminium Inserts per section.